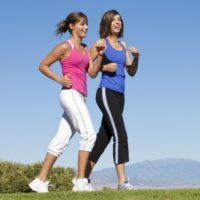 Home » Fitness » Adult Fitness » How Much Exercise Do You Really Need? Cardiovascular: The goal is to get 150 minutes of moderate-intensity aerobic activity per week (e.g., fast walking), OR 75 minutes of vigorous-intensity aerobic activity per week (e.g., running), OR an equivalent mix of moderate- and vigorous-intensity aerobic activity per week. It may sound like a lot, but break it up into four days of 40-minute cardio workouts or 3 days of 30-minute workouts with an hour-long hike on the weekend is totally doable! Figure out what works best for your schedule, and whatever you choose, make sure you enjoy it, that’s the key to sticking with it! Resistance Training: Besides cardio, resistance training activities are especially important as we get older because they help prevent muscle loss, keep our metabolism active, and keep our bones strong, thereby decreasing our risk of fracture. Engage in muscle-strengthening activities on 2 or more days each week, using all major muscle groups (legs, back, abdomen, chest, shoulders, arms). Don’t stress if you don’t have any weights; there are plenty of body weight exercises you can perform without any equipment, like squats, lunges, planks, pushups, and triceps dips. You can even get crafty and use heavy groceries, like a gallon of milk or a can of food, as at-home weights! These guidelines are the minimal requirements for the general population and are a great starting point when you’re feeling fitness dazed and confused. Remember, you can spread out your aerobic activity throughout the week as long so long as your total minutes add up to be close to the CDC’s recommendations. If 150 minutes of cardio per week seems daunting, don’t sweat; just start small. Think you can get in 30 minutes this week? Great– slowly build on your progress every week! You don’t need to reach these guidelines right away – simply begin where you feel comfortable and work your way to these recommendations and beyond! If you’re having a hard time getting started, check out 5 Roadblocks to Healthy Living. Comment on How Much Exercise Do You Really Need?